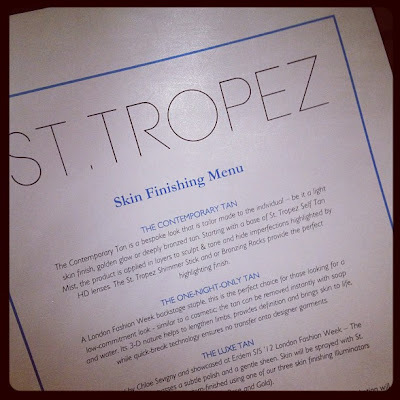 You may have seen my tweets a while back about attending a St Tropez event, where we were taught how to give ourselves a masterful, beautifully finished tan. I know what you fair-skinned beauties are thinking - 'F*** this sh**, I'm unsubscribing!' But hear me out! 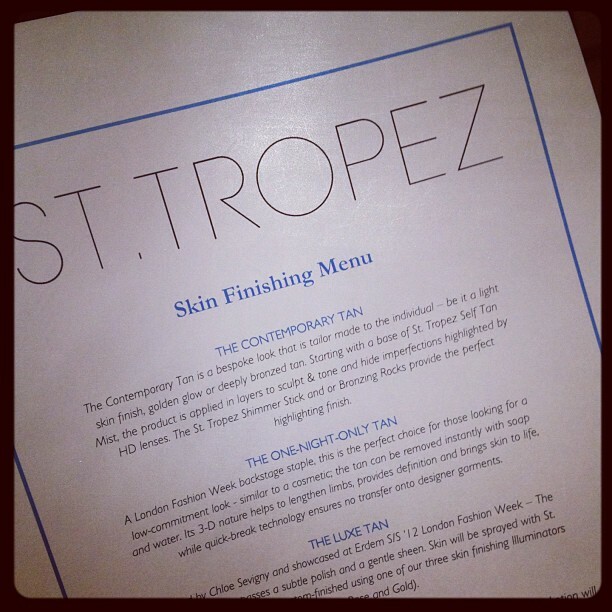 St Tropez have furnished a skin finishing menu that includes two special tans - called the Vintage Tan and the Pastel Tan - which cater to (and have actually been used at the Oscars on!) pastel beauties like Emma Stone and Gwyneth Paltrow. I am trying out the Pastel Tan on my sister's legs in the pictures below, to show you the effect that it gives. Bear in mind that the tan develops gradually over 4 hours or so, so the tan would look very much deeper and more golden than the photos below. I started off with the St Tropez Self Tan Bronzing Mist. This salon inspired, super light mist, delivers an even all over tan you’ve always wanted. Infused with conditioning aloe vera and long lasting colour, you’ll have a perfectly natural looking tan. Our innovative fragrance technology helps to take away the tell-tale aroma, to make way for a subtle, yet refreshing fragrance. This is a very light tan, so it can be layered on lightly just to even out the skintone and define the legs (which is what I would use it for, considering the fact that I love fair skin), or more heavily to give the legs a beautiful golden tan. I love the fact that this tan mimic's the skin's natural colour when it tans, instead of that horrid 'oompa loompa' tan that I so dread. Post tan: the colour has evened out, the legs look more smooth, and the skin looks healthier without actually looking dark or tan. As you can see in the pictures above, the tan does wonderfully to even out the skintone and make the legs look smoother and flawless. Of course, I am doing it this way because I love fair skin (so does my sister) but you can easily spritz another layer on to deepen the colour. Here, I spritzed each leg about 6-8 times to achieve a smooth, even finish. Next, we tried the Skin Illuminators to give definition and elongate the legs. The original illuminator was used backstage at Marios Schwab for S/S 2010 and has since proved to be an essential beauty must-have for its unique violet tone and luminous results. Now repackaged to bring it in line with the new collection, Violet still remains our best-selling skin finisher. Perfect for all skintones. My sister was really anxious to try this because she is going out on Friday and wants to wear a short dress and emphasize her legs. Then, we applied the Violet Skin Illuminator to the very highest points of the leg, in an area smaller than the area highlighted by the Skin Illuminator in Rose. And here is the final shot. The difference here is very subtle, because the light isn't hitting it in the perfect spots, but I wanted to give you a head-on angle so you could compare if you wanted to. If you look closely, the leg on the right is more dimensional, and applying the highlighter does create a nice elongating effect, as well! I am no lover of tanned skin, but as you can see above, St Tropez does cater to us fair-skinned girls as well. Their Self Tan Bronzing Mist is perfect for evening out any unsightly patches or discolouration in your skin, and helps match the skin on different parts of your body (you know what I'm talking about! My legs are 5x lighter than my hands and face, it's weird). Ready to try this at home? The Self Tan Bronzing Mist retails for AUD 59.95 per 240ml bottle, and the Skin Illuminators retail for AUD 29.95 per 50ml tube. Australian stockists here. These products were provided for review and consideration in accordance with this site's Disclosure Policy.